The next heavy truck of Iveco is spotted again, and this time we see a head to head photo of the Stralis and the new prototype. The angle of this picture makes the new one look smaller, but we think it is at least as big as the 2018 model. 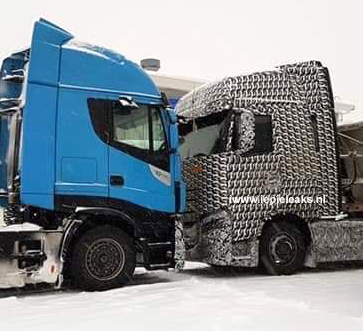 There have been some photo’s online of the new truck without camouflage and we think that is the design that Iveco is going to launch. When that is going to happen is the question. We espect the new Iveco before the end of this year.